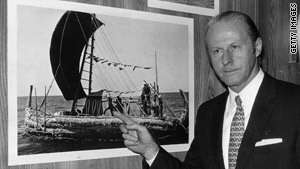 Thor Heyerdahl seen in 1970: Did ancient peoples cross oceans on wood rafts? (CNN) -- "Once in a while you find yourself in an odd situation," wrote Norwegian explorer Thor Heyerdahl in Kon-Tiki: Across The Pacific by Raft. "You get into it by degrees... [Then] you are suddenly astonished, and ask yourself how in the world it came about?" Considering that, at the time, he was adrift in the Pacific on a raft with five men and a parrot, it wasn't a strange question to be asking. On April 28, 1947 Heyerdahl had set out from the coast of Peru, cutting through the waves aboard Kon-Tiki, a simple raft made from balsa wood logs, based on drawings made by Spanish conquistadors, and begun a long, strange journey that would grip the world. His book became a best-seller and a documentary film about his voyage won an Academy Award in 1951. Heyerdahl's mission was to use primitive, indigenous technology to prove his theory that people from South America could have colonized Polynesia. To some it might have seemed at odds with the new era of the atom bomb and jet-powered flight. But to many, many others the explorer's courage, optimism and enthusiasm were the perfect distraction from a world still bruised by World War II and nervously watching the increasingly tense standoff between the United States and Soviet Union. Although Heyerdahl did take some modern equipment -- such as radios, charts and a sextant -- he argued these were all incidental to testing the theory that the craft itself could make the 4,300 mile journey across some of the most challenging seas on Earth. He was accompanied by five other men, four Norwegians and one Swede. All were recruited via a short note: "Am going to cross the Pacific on a simple raft to support a theory... Will you come? Reply at once." Kon-Tiki itself was made of nine balsa would tree trunks lashed together with hemp rope. 250 liters of drinking water were stored in bamboo tubes, and the crew took a large store of food with them, mainly a mix of coconuts, sweet potatoes and other fruit and vegetables -- plus a cache of survival rations donated by the U.S. military on the condition the adventurers submitted a review of their quality when they returned. This diet was supplemented with fresh fish caught as they traveled, including tuna and shark. Their journey began when the Kon-Tiki was towed 50 miles out to sea by a Peruvian naval tug. From there the crew plotted a course west, riding the Humboldt Current across the Pacific -- it would be more than three months before they saw land again. After many adventures and some frighteningly high seas they reached French Polynesia on July 30, skirting close to the isolated Puka Puka atoll. On August 4 they arrived at Angatau Island, but were unable to land safely due to a heavy swell. Three days later the Kon-Tiki struck a reef and the crew was beached on an uninhabited islet of Raroia Island -- 101 days and 4,338 miles from Peru. They had done it. But there was no one to greet them, and only stale rations to mark the occasion with. It was several days before some local men paddled over to investigate the source of strange flotsam that had washed up near their village, and found a group of jubilant, wiry, suntanned Scandinavians waiting for them, and they took the crew back for some belated celebrations. In time the crew left Raroia for Tahiti aboard the French schooner Tamara, and from there, took ship for home. "Waves were breaking out on the blue see," Heyerdahl later wrote. "But we could no longer reach down to them. White trade-wind clouds drifted across the blue sky. We were no longer traveling their way. We were defying nature now. We were going back to the 20th century which lay so far, far away. "But the six of us on deck, standing beside our nine dear balsa wood logs, were grateful to be all alive. And in the lagoon at Tahiti six white wreaths lay all alone, washing in and out, in and out with the wavelets on the beach." Their remarkable boat would ultimately find a resting place in the specially designed Kon-Tiki museum, Bygdøy, near Oslo, Norway -- but that was not the end of the story. In 2006 Heyerdahl's 29-year old grandson Olav set out from Callao, Peru, to retrace the journey of the Kon-Tiki in his own boat. Although a similarly "primitive" construction, the Tangaroa benefited from more recent research on ancient sailing techniques and had a broader sail, adjustable centerboards and a hardwood cabin. Olav described it as: "the raft my grandfather would have built today." Using Thor's logbooks Olav and his team drifted across the pacific in 93 days. "When we came to our end point in Tahiti the captain and I just wanted to keep on to New Zealand," Olav told reporters at the time. "I believe my grandfather would have been really proud of what we achieved."